His career began in 1984 with Legend, a tale of a fortress under siege. He wrote 30 novels in total. 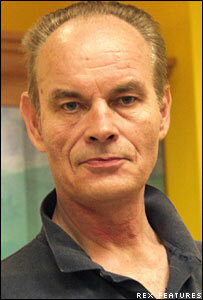 Transworld managing director Larry Finlay said Gemmell was "writing at the peak of his powers". "He was a true pleasure to work with," he said. "We will surely miss him, as will his thousands of devoted fans around the world. Our thoughts are with his wife Stella and his two children." A statement from the publisher said he died on Friday morning. It added: "His themes of heroic adventure, leadership, personal heroism and the possibility of redemption for every one of us ring as true today as they did when he first published the novel that was to become a classic of heroic fantasy, Legend." SFX magazine editor Dave Bradley said: "Gemmell wrote heroic fantasy novels - he had a real sense of adventure about him, wrote stories about great battles. "At the heart, they're cracking fantasy yarns but he also had a good eye for character and how people develop, like how a young soldier deals with war. "He had masterful plotting and a real sense of how excitement builds in a story. His books were real page-turners." The second part of a planned trilogy of historical novels, Troy: The Shield of Thunder No 2, is due to be published in September. Born in west London in 1948, Gemmell was expelled from school for gambling and went on to work as a labourer, driver's assistant and bouncer. He went on to become a journalist and editor of newspapers in Sussex, but his career ended after the publication of his third novel, Waylander, in 1986, after he used his colleagues' names for characters in the story. "The managing director regarded it as a poisonous attack on his integrity," he later recalled.